Audio equipment corporation Bose has officially launched Sleepbuds, the brand’s first headphones specifically engineered to help people sleep. Last November, Bose introduced the Sleepbuds prototype on crowdfunding site Indiegogo. Though pre-orders reached their cap in six days, it took several more months of research and development before they were ready to be reintroduced to the public this June. What’s unique about these buds? They’re the first Bose product to employ noise-masking technology designed to promote better slumber. Unlike most Bose headphones, the Sleepbuds have no capacity to play music at all. Instead, they come with 10 pre-loaded “sleeptracks” that are said to block disturbing frequencies from traffic, dogs barking, and noisy neighbors. In this way, the buds don’t “cancel” noise as much as they cover and replace it with relaxing audio. To learn more about this technology, I spoke with Sleepbuds product manager Liz Dylewicz, who told me it’s not just about ambiance — there’s a science to it. Noise-masking is a science, but it’s not a new idea. The difference here is in the application. Noise-masking works because of the way different sounds combine in our inner ears. If the sounds have the right match of frequencies, and the masking sound is just enough louder than the disturbing sound, your inner ear and brain cannot detect the disturbing sound. Related: Check out our sleeper’s guide to gadgets! Everything about the shape, form, and material make-up of the Sleepbuds was crafted to accommodate the needs of troubled or light sleepers. Not only are they extremely small (with each bud weighing in at under a gram), but their pliable sleep tips are engineered to sit flush in the ear. As Dylewicz explained, sleepers should be able to wear the buds throughout the night without any discomfort. She went on to tell me that the Sleepbuds aim to “solve a different problem” than other noise-canceling headphones. The global issue of sleep deprivation is steadily growing, and, according to Dylewicz, these buds could really help those who struggle with falling asleep at night. 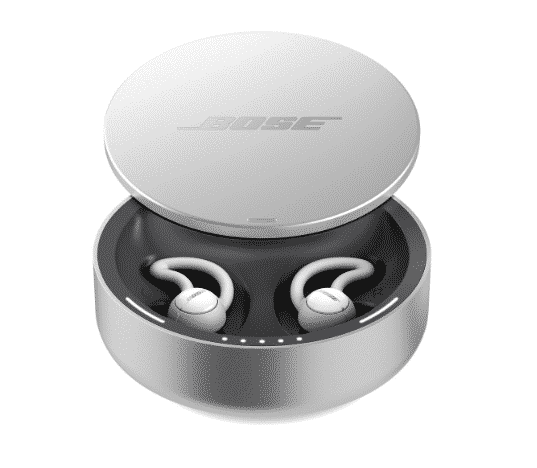 Bose Sleepbuds retail for $249 and are available online and in stores.